Summary: Gavin Sasaki is a promising young journalist in New York City, until he’s fired in disgrace following a series of unforgivable lapses in his work. It’s early 2009, and the world has gone dark very quickly. The economic collapse has turned an era that magazine headlines once heralded as the second gilded age into something that more closely resembles the Great Depression. The last thing Gavin wants to do is return to his hometown of Sebastian, Florida, but he’s in no position to refuse when he’s offered a job by his sister, Eilo, a real estate broker who deals in foreclosed homes. Also, Eilo has shown him a photo of a ten-year old girl who could be homeless and in trouble. The little girl looks strikingly like Gavin and has the same last name as his high school girlfriend, Anna, from a decade ago. Gavin—a former jazz musician, a reluctant broker of foreclosed properties, obsessed with film noir and private detectives and otherwise at loose ends—begins his own private investigation in an effort to track down Anna and their apparent daughter who, it turns out, have been on the run all these years. Every time I see that Emily St. John Mandel has a new novel out, I get excited. I've been lucky enough to meet her at various BEA events, and I think she's just sweet and adorable. But it's her writing that makes her extra- special. 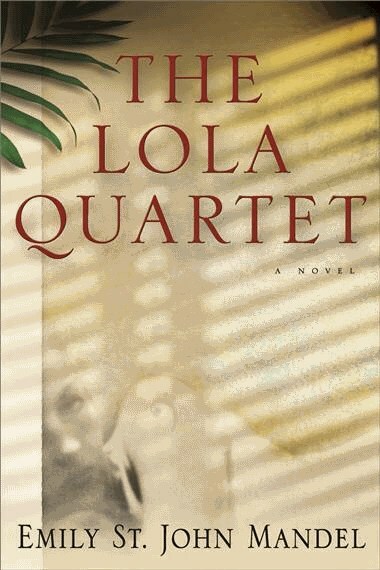 Her latest book is titled THE LOLA QUARTET and I thought it was excellent. It has already received a Starred Review from Library Journal as well as a some high praise from Publishers Weekly, and I definitely agree that it's worthy of the fuss. THE LOLA QUARTET is such a unique novel that it's hard for me to summarize in just a few sentences. Basically, THE LOLA QUARTET tells the story of Gavin, a journalist who has pretty much hitting rock bottom. He gets fired from his job as a reporter because his stories are no longer credible, and his girlfriend not only miscarriages their baby, but she also breaks up with him. When Gavin's sister Eilo shows him a photo of a little girl who looks an awful like like Gavin and has the same last name as Gavin's high school girlfriend Anna, Gavin reluctantly returns to his Florida hometown and begins to search for this child. I found THE LOLA QUARTET to be such an interesting story and really unlike anything I've read in recent memory. Perhaps that's one of the reasons that I enjoyed it so much -- it was fresh and I was drawn into the story from the first few pages. Of course, Ms. Mandel's writing style doesn't hurt either. I just love how she brought the characters to life and made them so incredibly real. And she definitely has a knack for writing some eloquent prose. Her descriptions of jazz music and the Florida setting were just so well done. I think she really outdid herself with this novel! As I write this review, I find that I'm at a bit of a loss as to how to articulate what this book meant to me. It's one of those novels that just really affected me. Not only did it entertain me, but it made me think! In fact, I wanted to talk about this novel with someone immediately after I finished it. That probably should be a sign that I think this novel would make a fantastic book club pick. Because the book really delves into some very unique characters, I think they would be fascinating to discuss. In addition, there are so many themes about basic human nature that warrant further discussion. I also loved the character development. While I found Gavin and Anna to be fascinating, I thought all of the characters were interesting. I absolutely loved how Ms. Mandel gave the reader enough background on each of the characters to make their actions seem authentic. However, it was how she tied the characters' lives together from their high school years to the present (about 10 years later) that really blew me away. She did a wonderful job of interweaving their stories and changing the points of view. And finally, I really appreciated how much this novel made me think about life in general. While I didn't necessarily relate to the characters or their actions on a personal level, I loved how this book explored love, friendships, obligations, emotions, guilt, etc. This novel showed how life can pack a powerful punch and throw things at us that we'd never expect, and how individuals deal with these challenges differently. In addition, THE LOLA QUARTET really delved into moral ambiguities and even made me consider how I might react if faced with certain hardships. I really can't say enough about THE LOLA QUARTET. I fear the my review only touched upon a few of the things that I loved about this novel, but I think the rest might just be best left to discover for yourself. Highly recommended! I read The Singer's Gun back when it came out...IN ONE SITTING. This is my litmus test, because this only happens once or twice a year. Loved it. It was familiar, but surreal and slightly bizarre. She is one of those authors that I know I need to pursue. Need to read this one. I cannot wait to read this. I got this in the mail from LT, and I loved her writing from her first book. I haven't read Singer's Gun, but that's on the to-read list. Wow, Julie. You've sold me on this book. I'll add it to my list right now! Wow, great review! It makes me want to go out and read this right away. Awesome review. I can't believe I haven't started reading this yet. MUST get to it soon. This sounds wonderful. I'm really curious about the meaning behind the title. Oh, man, this sounds REALLY good. It's the first time I've come across the title. Glad you liked it!